Inaugural meeting of the Estonian Meteorological Society. Photo credit: Piret Pärnpuu. Estonia has a long history of taking meteorological observations. The first regular measurements were made in Tallinn in the final decades of the 18th century. An important step forward was the foundation of the Meteorological Observatory at the University of Tartu on the 2nd of December 1865. This is considered as the beginning of professional meteorology in Estonia. Since then, continuous high-quality meteorological observations have been recorded in Tartu. The Observatory became the main meteorological centre in Estonia organising the meteorological network, leading scientific research and gathering people interested in weather and climate issues. During the Soviet period the Estonian Geographical Society was the only organisation that served as a forum for meteorologists, professionals employed in the state meteorological and hydrological service, academics working at the universities and research institutes, and for non-professional enthusiasts. From the 1960s the meteorological service set up a dense network of meteorological stations at collective and state-owned agricultural farms. Since the collapse of the Soviet Union responsibility for this network resides with the Estonian Naturalists’ Society. Its meteorology section collects the data and keeps the network functioning. They have been organising meetings for voluntary observers every summer since 2001 in different locations throughout Estonia. 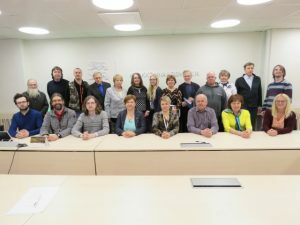 The meetings have been held jointly with the Estonian network of thunder observers since 2010. The main purpose of the meetings has been to listen to scientific presentations associated with weather and communication. Estonia Meteorological Society’s summer meeting in Mihkli village on a very hot day at the end of July 2018. Photo credit: Teet Malsroos. 150-year anniversary of the Meteorological Observatory at the University of Tartu led by Dr. Piia Post, Associate Professor of Meteorology and Climatology at the Institute of Physics at the university. 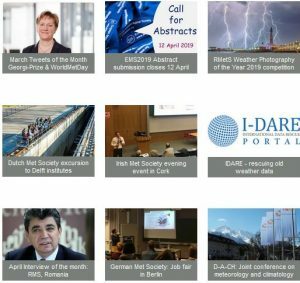 More than ten events were organised during the year, including a scientific conference, an international summer school for Ph.D. students, articles in a popular scientific journal and a photography competition for school students. The need for an Estonian Meteorological Society quickly became evident. There are several people working at the Estonian Weather Service, which is part of the Estonian Environment Agency, and at the universities as well as volunteer observers who want to belong to such an organisation, which brings people together who have a deep interest in meteorology. The Estonian Meteorological Society was founded at a meeting at the Estonian Environment Agency in Tallinn on the 23rd of March 2018, following a conference dedicated to World Meteorological Day. The Society began with 33 members and is already growing. Its statute was adopted at the meeting and a seven-member board was elected with Dr. Piia Post as chairperson. The society is a division of the Estonian Naturalists’ Society. It organised its first major event, a summer meeting, on the 28th of July. 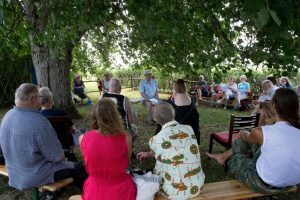 An experienced amateur weather observer, Ilmar Tiismaa, hosted about 40 participants in Mihkli village in the county of Pärnu. The Estonian Meteorological Society plans to organise various meteorological activities in the country. A significant role of the society will be to improve and regulate meteorological terminology in Estonian. However, its most important task is to bring together, and enhance communication between, professional meteorologists, academics and voluntary observers, who all work in the field of meteorology. The Society also hopes to become a member of the European Meteorological Society and the thunder observers hope to become a partner of the European Severe Weather Database.